Inspection and Maintenance (I&M) represents a huge economic activity (450 Bn€ market) spanning across sectors such as energy, transport, civil engineering. EU hosts over 50% of I&M robotics offer but there is a bottleneck connecting it to the market and high potential applications. RIMA is a 4-year project aiming to establish a network of 13 Digital Innovation Hubs (DIH) on robotics sharing best practices and providing services to facilitate uptake of I&M technologies. – RIMA is building upon the network pioneered by SPRINT Robotics extending it to all relevant sectors across the value chain. The overall goal of RESIST is to increase the resilience of seamless transport operation to natural and man-made extreme events, protect the users of the European transport infrastructure and provide optimal information to the operators and users of the transport infrastructure. The project will address extreme events on critical structures, implemented in the case of bridges and tunnels attacked by all types of extreme physical, natural and man-made incidents, and cyber-attacks. The RESIST technology will be deployed and validated at 2 pilots in real conditions and infrastructures. RESIST will use risk analyses and leverage and further develop recent exploitable research results in robotics, driving under panic, sensing and communications, to dramatically improve the speed and effectiveness, while reducing the cost, of structural vulnerability assessment, situation awareness, response operations and increased users’ protection under extreme events towards a high level of resilience of the transport infrastructure at 3 levels: a) increased physical resilience of bridges/tunnels by robotic inspection and predictive analytics; b) restoration of services/routes back to normal quickly and permission of a continuous flow of passengers and freight across different modes of transport soon after an extreme event, which will be achieved by rapid and accurate robotic damage assessment after extreme physical events, cyber security solutions, alternative secure and continuous communication under emergency operations (including integration of terrestrial and satellite systems) and increased cross-modal flexibility; c) clear and effective communication of transport operators and users, emergency responders and the public in the vicinity, to minimise the impact of the disruption on people and businesses, by exploiting real-time data, available networks, social media and mobile technologies to allow for real-time emergency information dissemination. The scope of the SAFEDRONE project is to acquire practical experience in Very Low Level (VLL) operations where general aviation, state aviation and optionally piloted aircrafts and drones will share the airspace. It is important to highlight that this project will have a clear practical focus which primary activities will be innovation, integration, and especially, demonstrating activities with flight tests. 1. Demonstrate how to integrate general aviation, state aviation, optionally piloted aircrafts and drones into non-segregated airspace in a multi-aircraft and manned flight environment, in order to explore the feasibility of U-Space vision by 2019. 2. Perform a large number of demonstrations in order to accumulate evidences and experience about the required services and procedures necessary to operate drones in a safe, efficient and secure way within U-Space. 3. Validate proof of concept implementations of a large variety of U-Space services and procedures. 4. Provide evidences to EASA and National Aviation Authorities to reinforce the safe integration of drones under U-Space for the different drone categories. Also, the lessons learnt and the technologies used during the project will be proposed to the different standardization bodies. 5. Coordination with the recently approved SESAR-RPAS projects in order to align the demonstrations with the CONOPS and technological developments of these projects. 6. Increase the awareness of the advances in U-Space within Europe through the dissemination of the obtained results. Finally, SAFEDRONE consortium is formed by 2 private companies (INDRA and UNIFLY), 2 government-owned companies (IAI and ENAIRE), two aeronautical research centres (CATEC and CRIDA) and one university (University of Seville) obtaining a balance among accessing to novel technology, integration and operational experience, and orienting the demonstrations towards real market needs. The need for a facilities network is the aftermath of the TerriNET’s creation. TerriNET is concerted between 16 universities and researching centres within the European Union. This project aims to enhance the robotics researchings. For that purpose, each member offers its platforms and facilities. Also, it is intended to create a new generation of researchers. The objectives include the creation of a multidisplinar and trans-national environment for the trading of ideas for the robotics researching as well as to enable users their fully access to exploit their potential. The objective of GAUSS project is the achievement of aceptable level in terms of performance, safety and security for bothc, current drone and future U-Space operations. The researchings will be focused on the consecution of precise and secure positioning to enable U-Space operation, supporting the management and coordination of all drones in the VLL airspace. GAUSS involves seven partners as University of Seville, Everis, Institut de Robòtica, Aratos Systems and Cranfield University. HYFLIERS is a research and innovation action of EU Horizon 2020 programme for advanced robot capabilities research. 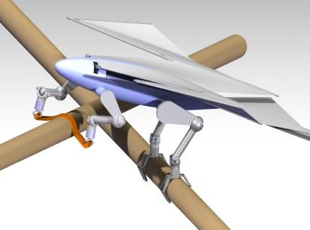 This project aims to develop the world’s first industrial integrated robot with hybrid air and ground mobility with a long-reach hyper-redundant manipulator capable of reaching sites potentially dangerous working conditions. The results target the thickness measurements for oil and gas refineries and chemical plants, and could be applied for many other robotic inspection technologies. The objective is the UAS development for inspection measurements. In these kind of industries there is a risk of excesive pipe corrosion because of the degradation caused by exposure to the environment within the production process. This may lead to accidents as catastrophic failures with explosions and release of toxic products, so the inspection processes ensure that plants are in safe operating conditions and provide alerts to execute necessary corrective actions. But these inspections carry out a lot of risks because they’re executed on elevated locations with ladders, scaffolds, rope acesses or cranes. This is why, HYFLIERS project will aim to develop a robotic system to minimize these risks. MarineUAS is an EU-funded doctoral program to strategically strengthen research training on Autonomous Unmanned Aerial Systems for Marine and Coastal Monitoring. It is a comprehensive researcher training program across a range of partners in several countries designed to have high impact on the training of individual researchers and their knowledge, skills and their future careers. MarineUAS has established a unique cooperative environment. It takes benefit of the partners’ extensive and complementary knowledge, field operational experience, and experimental facilities. The relations between robotics and energy for space and terrestrial applications are studied. The main objective of this study is, in general terms, the identification of technologies in different domains defined by the European Space Agency (ESA), that could be relevant for European space industry. The AICIA participation in the project is focused on the robotics and remote sensing applications including both planetary and orbital robotics. Funded by Abengoa Hidrógeno, S.A. and European Space Agency. 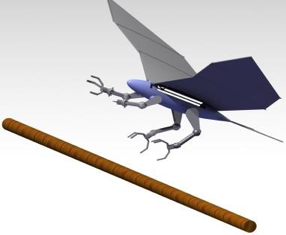 Development of technologies that will help to create Long Endurance Multi-UAV applications, including control algorithms for the extension of the endurance of UAVs using wind energy. Development of control and estimation algorithms for all-weather UAV operations. This includes estimation and planning techniques to avoid weather hazards and control techniques to overcome extreme weather conditions. Development on new fully distributed methods for real-time cooperation of entities, involving fault adaptive reconfiguration of the trajectories for long endurance applications. Reinforce relations between the different research groups and exploit their synergies. Knowledge transfer on long endurance multi-UAV applications. This year, two members of the Robotics, Vision and Control Group (University of Seville) conducted two research stays at the University of Sydney (Australia). The goal is to provide an integrated planning and maintenance platform that enables the deployment, operation and maintenance of heterogeneous networked Cooperating Objects in an efficient way. The platform specifically focusses on large-scale systems composed of unmanned ground and aerial vehicles cooperating with wireless sensors and actuators. PLANET addresses the design of the platform and algorithms required to support the deployment and maintenance of heterogeneous systems with mobile and static nodes. The most challenging algorithms that will form the core functionality of the PLANET platform are: optimal planning to achieve optimal coverage; network-centric sensing and actuation; cooperative transportation and retrieval of nodes; data muling techniques; secure, non-intrusive monitoring of the network for failures and possible threats. The PLANET platform will be validated in two very different scenarios: An environmental and wildlife monitoring application deployed in the Doñana Biological Reserve (Spain); and the management of a highly automated airfield. The consortium includes Universität Duisburg-Essen (coordinator- Germany), FADA-CATEC (Spain), SELEX Galileo (UK), DLR (Germany), BR&TE (Spain), University of Edinburgh (UK), University of Pisa (Italy), CSIC (Spain), Flying-Cam S.A. (Belgium), ETRA (Spain), SELEX SI (Italy) and AICIA (Spain). The vision of Cooperating Objects is relatively new and needs to be understood in more detail and extended with inputs from the relevant individual communities that compose it. This will enable us to better understand the impact on the research landscape and to steer the available resources in a meaningful way. The main goal of CONET is to build a strong community in the area of Cooperating Objects capable of conducting the needed research to achieve the vision of Mark Weiser. Create a visible and integrated community of researchers on the topics related to Cooperating Objects capable of driving the domain in the coming years. Identify, arise awareness and steer academic research efforts towards industry-relevant issues without forgetting fundamental scientific issues; make the community more reactive to novel issues and approaches, and to coordinate its efforts; establish tight relationships with the European industry, leveraging interactions with leading US institutions in the field. Stimulate cooperation between researchers in order to achieve a lasting and sustainable architecture that is able to cope with the vision of Cooperating Objects. European cities are becoming difficult places to live due to noise, pollution and security. Moreover, the average age of people living European cities is growing and in a short period of time there will be an important community of elderly people. City Halls are becoming conscious of this problem and are studying solutions, for example by reducing the free car circulation areas . Free car areas imply a revolution in the planning of urban settings, for example, by imposing new means for transportation of goods, security issues, etc. In this project we want to analyse and test the idea of incorporating a network of robots (robots, intelligent sensors, devices and communications) in order to improve life quality in such urban areas. The URUS project will be focussed in designing a network of robots that in a cooperative way interact with human beings and the environment for tasks of assistance, transportation of goods, and surveillance in urban areas. Specifically, our objective is to design and develop a cognitive network robot architecture that integrates cooperating urban robots, intelligent sensors, intelligent devices and communications. Among the specific technology that will be developed in the project, there will be: navigation coordination; cooperative perception; cooperative map building; task negotiation; human robot interaction; and wireless communication strategies between users (mobile phones), the environment (cameras), and the robots. Moreover, in order to make easy the tasks in the urban environment, commercial platforms that have been specifically designed to navigate and assist humans in such urban settings will be given autonomous mobility capabilities. Proof-of concept tests of the systems developed will take place in a car free area of Barcelona. The initiative of this project comes from the European Group inside of the Research Atelier on Network Robot Systems (a European project) which is producing a Roadmap of Network Robots in Europe. The general objective of the project is the design, development and experimentation of a platform providing the middleware and the functionalities required for the cooperation among aerial flying objects, i.e. autonomous helicopters, and a ground sensor-actuator wireless network, including mobile nodes carried by people and vehicles. The platform will enable the operation in sites with difficult access and without communication infrastructure. Then, the project considers the self-deploying of the network by means of autonomous helicopters with the ability to transport and deploy loads (communication equipment and nodes of the ground network). Embedded Wisents: Cooperating Embedded Systems for Exploration and Control featuring Wireless Sensor Networks. Coordination Action funded by the European Commission under the Information Society Technology (IST) priority within the 6th Framework Programme (FP6). The project addresses the strategic objective of “Embedded Systems”. Embedded Wisents is a joint effort between twelve partners from ten different European countries. These partners have strong backgrounds in wireless communication and distributed computing as well as in embedded systems and cooperating objects in general. They have relevant expertise in ubiquitous communication, wireless sensor networks, distributed control, and cooperative autonomous systems in particular. This project explores the commonalities and complementarities of embedded control systems for some physical process (machinery, automobiles, etc. ), pervasive and ubiquitous computing, and wireless sensor networks. The important notions of control, heterogeneity, wireless communication, dynamics/ad hoc nature, and cost are examined. AICIA leads the Workpackage Road Mapping and Technology Adoption. This Workpackage includes the development of four studies in selected areas: Applications and Application Scenarios, Paradigms for Algorithms and Interactions, Vertical Systems Functions, and System Architecture and Programming Models. The Workpackage also addresses visions for innovative applications, and the research Road Map preparation. The partners of Embedded Wisents are: Technische Universität Berlin (coordinator), University of Cambridge, University of Copenhagen, Swedish Insitute of Computer Science, University Twente, Yeditepe University, Consorzio Interuniversitario Nazionale per lInformatica, University of Padua, Swiss Federal Institute of Technology Zurich, AICIA, Institut National de Recherche en Informatique et en Automatique, and Universitat Stuttgart. COMETS: Real-time coordination and control of multiple heterogeneous unmanned aerial vehicles. Funded by the European Comission. V Framework Programme Information Society Technologies (IST) Programme. Participants in this projects are: AICIA-Universidad de Sevilla, España (Scientific and Technical Coordinator), GMV, S.A. España (Financial and Administrative Coordinator), LIU-Linkoping University (Sweden), HELIVISION (España), CNRS-Centre National de la Recherche Scientifique (Francia), TUB-Technische Universitaet Berlin (Germany), ADAI-Universidade de Coimbra (Portugal). Contract No. IST-2001-34304. 2002-2005. The main objective of COMETS is to design and implement a distributed control system for cooperative detection and monitoring using heterogeneous Unmanned Aerial Vehicles (UAVs). Particularly, both helicopters and airships will be included. In order to achieve this general objective, the project will design and implement a new control architecture, will develop new control techniques, and will integrate distributed sensing techniques and real-time image processing capabilities. In order to test and validate these concepts and systems, COMETS will demonstrate the system in forest fire applications. This is a very challenging mission in which the cooperation of the UAVs is very valuable. 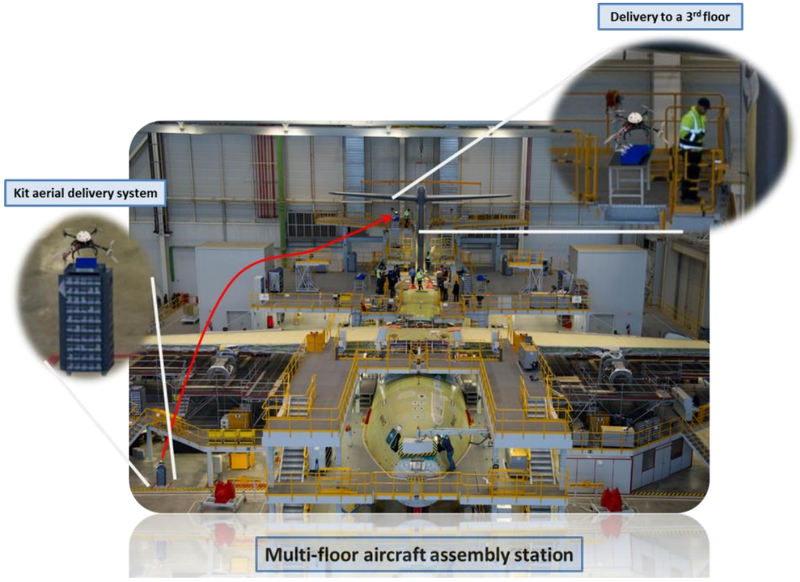 The Workprogramme consist of 9 Workpackages: Management, Specifications, Architecture (design, development, communications, and interaction and cooperation paradigms), Central real-time coordination and control (mission planning, mission monitoring and control, real-time simulator, and teleoperation tools), Distributed reliable autonomous real-time control (helicopter upgrading and integration, airship upgrading and integration, fault detection and reliability tools, UAV control methods), Cooperative Environment Perception (detection and monitoring perception tools, cooperative terrain mapping), Testing and Validation, Field Experimentation and Demonstration (preparation and coordination, field experiments, post-experiment analysis), and Dissemination and Exploitation. Special attention will be devoted to all the aspects related to reliability (architecture, communications, UAV fault detection techniques), and the exploitation of the characteristics of the multi UAV system. The project methodology is based on the use of existing UAVs. Four partners have UAVs with different characteristics and three of them will be integrated in the system. A key aspect is the experimentation. That will include local UAV experiments and general forest fire experiments. An special site will be conditioned and additional means for data acquisition and verification will be deployed. The expected results will be: a new system for cooperation and control of multiple UAVs, a decentralized control system with wireless communications in stringent real-time conditions, a new control architecture, new UAV control techniques, new perception methods, new techniques for environment monitoring and forest fire fighting. For further information, reference to http://grvc.us.es/comets/. SPREAD provides a framework for the development and implementation of an integrated forest fire management system for Europe. It will develop an end-to-end solution with inputs from Earth observation and meteorological data, information on the human dimension of fire risk, and assimilation of these data in fire prevention and fire behaviour models. It will provide new tools for fire management, in close collaboration with regional and national forest agencies, and new approaches to post-fire landscape management. The role of our group is the development of vision-based functions for fire detection and monitoring, using visual and infrared images gathered by fixed and aerial cameras. The group will integrate a previously developed detection system to forest fire fighting activities; new image processing functions to determine fire characteristics (such as the flame geometry or the smoke plume configuration) will be developed; integration of the previous tools with Geographical Information Systems (GIS) for fire control improvement. Also, a novel automatic system to assess the fire fighting means to be sent for the fire initial attack (very important for fire fighting) will be developed. Participants in this project : ADAI – University of Coimbra – Portugal (Coordinator), Algosystems S.A. (Greece), CEREN (France), UALH – University of Alcalá de Henares (Spain), CEAM – Center of Environmental Studies of The Mediterranean (Spain), University of Castilla la Mancha (Spain), University of Torino (Italy), COMC – Commission of the European Communities (Brussels), ENSMP – École Nationale Supérieure des Mines de Paris (France), CGREF – Centre National du Machinisme Agricole (France), ARMINES – Association pour la Recherche et le Développement des Méthodes et Processus Industriels (France), UZUR – Universitaet Zuerich (Suitzerland), CNRS-Centre National de la Recherche Scientifique (France), UAVR- University of Aveiro, (Portugal), AICIA – University of Seville (Spain), FFRI – The Finnish Forest Research Institute (Finland), MGP – Max-Planck-Gesellschaft zur Foerderung der Wissenschaften e.F. (Germany) and CFSCA – Canadian Forest Service – Natural Resources Canada (Canada). For further information, reference to http://www.algosystems.gr/spread. TELEAGRISOL: Remote experimentation of monitorization techniques through Internet with applications in Agriculture and solar energy. To demonstrate the application of Internet for remote monitoring. To improve the application of plant growing models, through the real-time extraction of image features, for intelligent environmental control of greenhouses. Particularly, the goal is to obtain plant growing indices from digital images taken in the greenhouse.To develop methods for solar energy prediction based on the real-time feature extraction from sky images. During 2004 the camera-based greenhouse monitoring system has been installed. Furthermore, two software applications have been developed. One of them is devoted to achieve the second project goal: the real-time extraction of plant features. Particularly, images of tomato plants captured in greenhouses are processed to obtain measurements of the vegetation index, plant height and number and size of fruits. The second software application is related to the third project goal: the extraction of features from sky images. Particularly, a cloudiness index and an estimation of sky colour are computed. The project participants are: Universidade do Algarve, Universidade de Trás-os-Montes e Alto Douro and AICIA. Funded by the 6th Framework Programme (FP6) as part of the Information Society Technologies (IST) Future and Emerging Technologies (FET) programme on “Beyond Robotics”. EURON II is a direct continuation of the original European Robotics Network (EURON) of the Fifth Framework Programme. It is a network of excellence under the 6th Framework Programme (FP6), funded as part of the Information Society Technologies (IST) Future and Emerging Technologies (FET) programme on “Beyond Robotics”. EURON´s objective is to implement and maintain a Network of Excellence that allows coordination of research, teaching and education, academic-industry collaboration, and publications and conferences in the area of robotics throughout Europe. EURON will also provide a primary portal for information about European robotics to other interested parties, such as journalists, and roboticists outside Europe. EURON is organised around a number of Key Areas: Research Coordination, Education and Training, Industrial Links and Dissemination. Summer schools and a number of ad-hoc activities are organised each year with competitive calls for proposals during October and March. These are mostly related to: prospective research projects, research ateliers, and topical studies. Grants are available for all of these activities. AICIA has been member of EURON from his constitution and has been coordinating the Field Robotics interest group. Funded by the Comisión Europea. Energy, Environment and Sustainable Development. Contract nº EVG1-2001-00024. 2002-2006. Eufirelab is a virtual laboratory for research and development activities related to forest fires. EUFIRELAB is intended to create an efficient Area of European Research in the environment of forest fires. Its goals are the improvement of science and technology in the field, and a fast and systematic transfer of knowledge to the final users. EUFIRELAB is structured in units to improve the cooperation among Euro-Mediterranean research teams or groups; activate wide interchange of knowledge and know-how; develop concepts, languages and common approaches between teams; promote the common use of research facilities and/or technological developments. EUFIRELAB is divided in research units that will develop common concepts, approaches and languages, and will elaborate common methods and research protocols and/or activities of technological development, integrating the different space scales and roles of the natural Euro-Mediterranean areas. The group coordinates the unit devoted to measurement methods in forest fires, whose main goals are to elaborate common measurement methodologies and protocols, to develop specific tools easy to understand by the users. To improve the existing sensors and promote fire measurement in the visual and infrared spectra, EUFIRELAB will create a Center that will develop new instruments and will stimulate the dialog between researchers, engineers and technicians. Funded by: European Commission. 5th Framework Programme. Directorate General Information Society DG INFOSO. Future and Emerging Technologies Programme. EURON is a network of excellence in robotics, that is aimed at coordination and promotion of robotics research in Europe. The network is sponsored by the European Commission through the Future and Emerging technologies Programme. The network members represent most of the major research groups in Europe and it also features a wide range of companies involved in robotics. The network has a set of key areas related to research planning and coordination, education and training, publications and conferences, industrial links and international links. EURON has several interest groups: Cooperative robotics, humanitarian demining, eduntainment, manipulation and grasping, multi-modal interaction, open-source robotics, skill learning, tele-robotics, manufacturing, sensor systems, mobile robots navigation, biomedical engineering and field robotics. AICIA researchers coordinate the Field Robotics Interest Group. In the first year several seminaries and meetings, including a general meeting, have been organized. A draft of the European Robotics Research Roadmap has been prepared, and several education and training activities have been carried out. DEDICS: Distributed Environmental Disaster Information and Control Systems. Funded by the European Commission, DG XIII, Telematics Applications Program (Environment Sector), EN 1003. 1996-1998. DEDICS is a telematic tool designed to facilitate environmental disasters management by providing users with a set of functions to support monitoring, control and decision. The current work concentrates on forest fire detection and fighting. A system for early detection of forest fire using several sources of information (thermal images, video images, meteorological data, GIS data) has been designed in Seville and is being integrated in a Telematic system with real time decision support tools to assist the operators in the forest fire fighting. The system will use Artificial Intelligent Techniques for false alarm reduction. Furthermore, the Spanish user requirements on communications, sensors and decision support systems have been studied. Funded by the European Commission in the Fourth Framework Programme. Environment and Climate. DG XII. ENV4-CT98-0700. 1998-2000. The partners of this project are ADAI-Universidade de Coimbra (Coordinator), AICIA (Spain), Algosystems (Greece), Agroselviter-University of Torino (Italia), Entente Interdepartamentale en vue de la Protection de la Foret contre l´Incendie (France), Swiss Federal Institute for Forest, Snow and Landscape Research (Switzerland), Université d´Aix Marseille (France), Universidad de Alcalá de Henares (Spain), Universidade de Aveiro (Portugal) and University of Zurich (Switzerland). The project is devoted to the forest fire research including information acquisition, modelling and information support tools for forest fire suppression and safety. 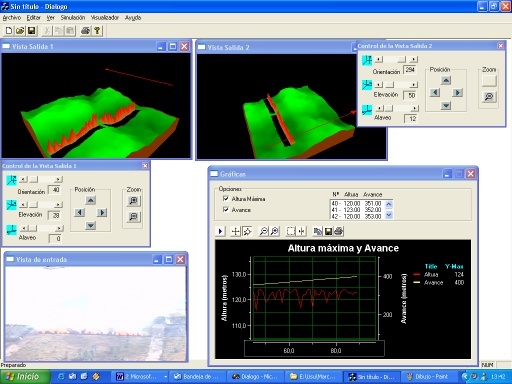 In the last year of the project, AICIA´s main activities are related to the debugging of the developed methods and to the analysis and validation of the results that have been obtained in the previous years, using terrain maps to improve measurements precision. Furthermore, the following methods have been developed: new techniques for smoke columns segmentation and localization, automatic umbralization of infrared images, and techniques for filtering the results of the analysis of the sequence of images to avoid the effect of vibrations and other perturbations in the measurement. At the same time, the fire monitoring tool have been updated to apply in real time these new techniques. 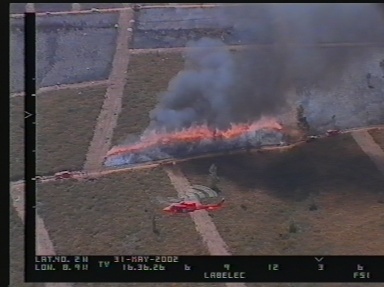 New experiments have been carried out in Gestosa, near Coimbra (Portugal) in May 2001, using several cameras, visual and infra-red, at different locations (ground and helicopter with GPS) obtaining the measurements (flame properties: height, width; and rate of spread, etc) using computer vision techniques, autonomous geo-referencing and sensorial fusion information. Furthermore, the measurements are also used to build geometric 3D models of the fire front. 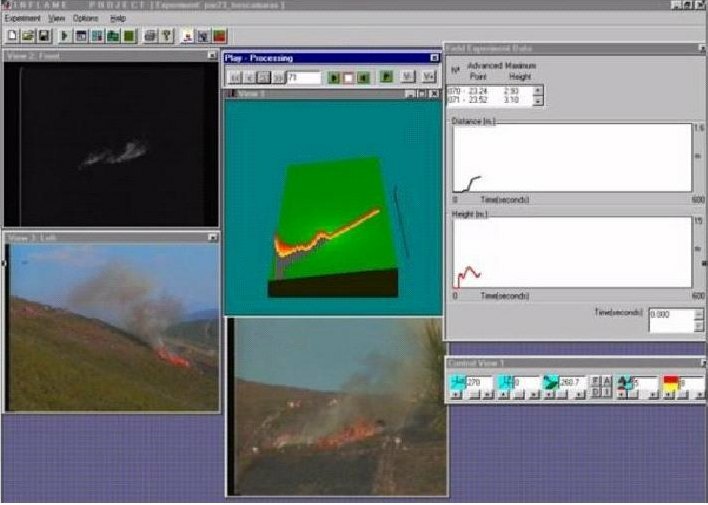 Screen of the real-time forest fire monitoring tool developed in the INFLAME Project: infrared image, visual images, 3D model, evolution of the most advanced point and evolution of the flame height. Robot Inspection and Repairing  ROSPIR. Funded by the European Commission. 4th Framework Programme. CRAFT-BRITE. Contract No. BRST-CT97-0474. 1997-1998. 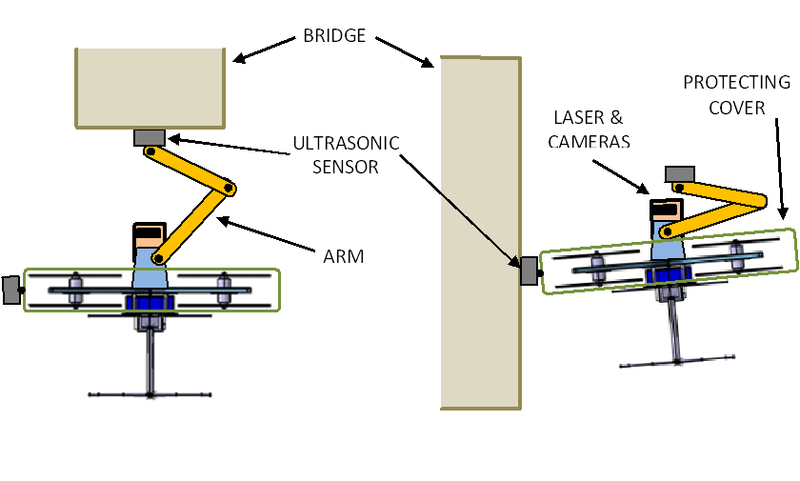 Design of new robotic devices and systems for inspection and repairing inside pipes. Analysis of existing devices for the applications in urban and industrial networks. Funded by the European Commission, 4th Framework Programme, ESPRIT. LTR Project 21911. 1996-2000. Partners: Université Libre de Bruxelles (Coordinator), AICIA-Universidad de Sevilla (Spain), Delft University of Technology (The Netherland), Lund University of Technology (Sweden), Siemens Automotive (France) y Laboratoire d´Architecture et d´Analyse des Systemes-CNRS (Subcontractor, France). Research in new techniques for the analysis and design of multivariable fuzzy control systems. The project concentrates on hybrid systems, predictive control systems and adaptive control systems. Takagi-Sugeno fuzzy models are used for identification and control. Several computer tools for the design of these multivariable control systems have been developed. Particularly the tool called FAST (Fuzzy Algorithm Stability Tool) has been designed in Seville. The project considers two control benchmarks: a direct injection engine and a waste water treatment plant. Furthermore, in Seville the results have been applied to the fuzzy control of autonomous vehicles. Fuzzy Algorithms for Control (FALCON). Funded by the European Communities (ESPRIT Programme). 1993-1995. Methods for designing stable and robust fuzzy control loops. Application to mobile robot control. Research and Technology Development for Planetary Rovers. Funded by NASA/INTA Research in Planetary Robotics (1992-1995). Project in the framework of planetary robotics included in the agreement on Space Activities (NASA/INTA protocols) between the United States of America and Spain. USA principal investigator: W. Whittaker. This project was a cooperative research with the Robotics Institute at Carnegie Mellon University (Pittsburgh, USA). The activities were oriented to the development of planetary robotics and particularly to contribute to the Lunar Rover Program which was developed at the CMU. The objective was a moon excursion to perform a two year, one thousand kilometer traverse visiting the historic landing sites, performing lunar science and providing realistic experience of lunar exploration.